Owing to the multiple possibilities of pathology of the tendon itself and its pulley system, the long head of the biceps is often a cause of shoulder pain. Surgical treatment for disorders of the long head of the biceps is limited to removal of the intra-articular portion of the tendon, with either tenotomy or tenodesis. Biceps tenodesis with or without rotator cuff repair, is a common and well-accepted open surgical procedure. 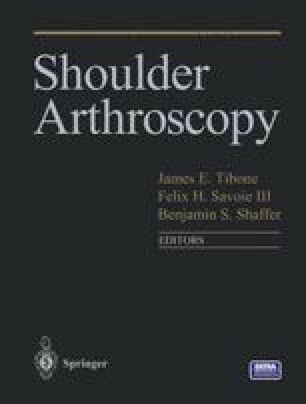 Previous authors have described biceps tenodesis under arthroscopic control, either using isolated sutures (Habermeyer) or sutures with anchors (Snyder, Gartsman). Because of familiarity and success with the technique of interference screw fixation for hamstring anterior cruciate ligament (ACL) reconstruction grafts in a bone tunnel, a similar technique was developed for use in both open and arthroscopic tenodeses of the biceps.